Girls set AP Computer Science record…skyrocketing growth outpaces boys #MakerEducation « Adafruit Industries – Makers, hackers, artists, designers and engineers! Exciting news for everyone from Medium! Ten years ago, just 2,600 female students took the AP Computer Science Exam. Fast forward to 2017. 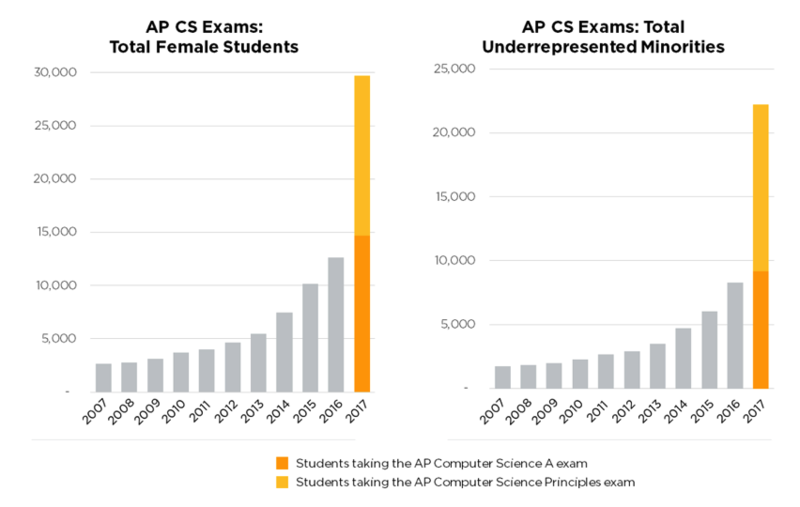 Over 29,000 female students took an AP CS exam this year, which is more than the entire AP CS exam participation in 2013 when Code.org launched. Though computer science has seen sustained growth year after year, the introduction of AP CS Principles this past school year was the largest College Board AP exam launch in history, and has skyrocketed participation in CS especially among female students and minorities. The growth among female students has been incredible, increasing participation in AP CS exams by 135% since 2016. Not to be outdone, underrepresented minorities have increased participation by nearly 170% over last year!